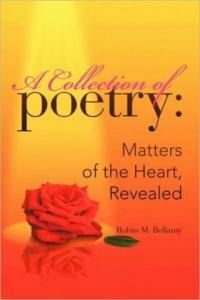 "A Collection of Poetry: Matters of the Heart, Revealed", a deeply personal poetry collection by Bellamy, brings together a lifetime of work by the pensive author; a kaleidoscopic mix of lyrical gems that touches on the many sides of life with stunning depth and sensitivity. The themes of this sterling volume are truly an eclectic mix, providing Bellamy a diverse layout of avenues to showcase her infectious optimism, delicate sensitivity, and philosophical depth — and she succeeds spectacularly in this volume. The result is a poetry collection like no other; one that strongly warrants a slot in every poetry enthusiast's collection.